Did you know your eye has a sphincter? It's true! In fact, you have more than fifty sphincters in your entire body, and most of them have nothing to do with controlling your bowel movements. Case in point: the sphincter that helps control how much light passes through to your retina. Alternatively known as your "pupillary sphincter" or "pupillary constrictor," your iris sphincter is located in, well, your iris, where it encircles the pupil. When your pupillary sphincter contracts, it decreases the diameter of your pupil in a radial fashion, allowing less light to pass through. This is an involuntary physiological response, most commonly observed in the form of a reaction to the presence of light (click here to see this constriction in action). 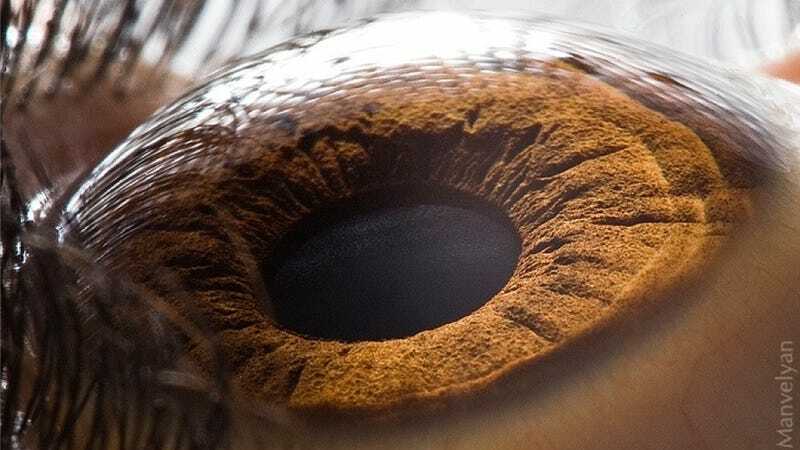 Connected to your iris sphincter is a collection of fibrovascular tissue (pictured up top in stunning detail, resembling a craggy Martian landscape) that helps make up what is referred to as the "stroma" of iris. All these components are part of an intricate system of structures that, collectively, enable us to see everything that surrounds us (everything, that is, but those things that reside in our blind spots).